With their crystal-like appearance and colour changing LEDs, these clear acrylic Christmas trees are a beautiful way to brighten your home. The 12cm tree which look lovely displayed beside one another in ascending or descending order. When switched on, the colour changing LEDs shine through the acrylic glass to stunning effect. The trees are great for adding seasonal sparkle to a windowsill, mantel or table top at Christmas. CLEAR ACRYLIC DECORATIVE TREES.Features hand painted ornaments on tree. 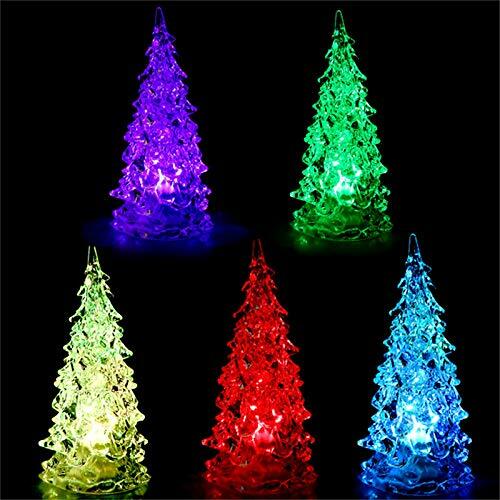 COLOR CHANGING CHRISTMAS TREES. Great accessory for holiday decorating. Display on a fireplace mantel, book shelf, tabletop centerpiece, cabinet, window sill, dining room, kitchen, living room, bathroom. LED LIGHTED XMAS TREE. This set of trees would look perfect in any holiday village display or nativity scene. Use them on your mantle for a beautiful xmas display. ICY CRYSTAL TREES. These hard plastic trees look like icy white winter evergreens. These are the perfect addition to any CHRISTMAS DECORATIONS this year. Nice tabletop display for any christmas centerpiece or coffee table.